° Beautifully updated SFA, hardwoods, open floorplan, second living up, large bedrooms, large master, 2-car garage, gated entrance. Lots of closet space. Pets on a case by case basis. ° Additional Info: Pets allowed limit 1, unfurnished, 2 covered parking space(s), 1 fireplace(s), Highland Park ISD. ° Listing Agent: Lyn Williams, Compass RE Texas, LLC. ° Luxurious Single Family Attached rental built by Hudson Construction Group. Huge living spaces and large fenced in yards make this a unique opportunity for high end renting in the heart of Dallas. The home has 3 beds, 3.1 baths, 3,098 sqft. First floor living, kitchen, dining, and study. 2nd floor has 3 bedrooms all with on suite baths. Third floor boasts huge gameroom and wet bar that opens up to a rooftop deck with views of downtown. Oversize 22x23ft garage allows for 2 huge sedans plus storage space in the back. 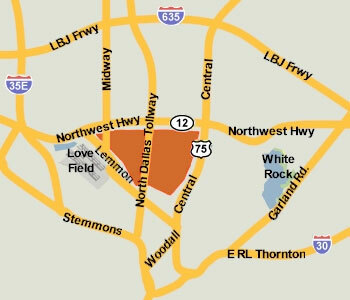 Minutes from Love Field, toll road, and popular restaurants and nightlife this location is hard to beat. ° Additional Info: Pets allowed limit 4, unfurnished, available now, 2 covered parking space(s), Dallas ISD. ° 1 Year old 2018 COMPLETED BY VETERAN BUILDER JGH, OFFERS NEW HOME AMENITIES , TRANSITIONAL OPEN FLOOR PLAN & LARGE LIVING SPACES. ENTER PAST A LIGHT-FILLED LIBRARY INTO THE MAIN LIVING AREA, CAST STONE FIREPLACE, ADJACENT TO THE DINING ROOM & WET BAR. FEATURING AN ISLAND BREAKFAST BAR, GAS COOKING & PANTRY, WHITE MARBLE KITCHEN OPENS TO THE LIVING & DINING AREAS AND THE OUTDOOR PATIO. UPPER LEVEL OFFERS MASTER SUITE WITH WHITE MARBLE BATH, DUAL VANITIES, FREESTANDING TUB, SEPARATE SHOWER & ABUNDANT CLOSET SPACE. 3 ADDtl BEDROOMS, 2 BATHS & A UTILITY ROOM COMPLETE THE 2ND LEVEL. 3RD LEVEL CAN SERVE AS A GAME ROOM WITH WET BAR OR A 5TH BEDROOM W FULL BATH, NEAR HP MIDDLE SCHOOL, SMU AND SHOPPING. ° Additional Info: Pets allowed, unfurnished, onsite W/D connections, available 6/14, 2 covered parking space(s), 1 fireplace(s), Highland Park ISD. ° Listing Agent: Marc Ching, Allie Beth Allman & Assoc.